Tired of the stress and complications of modern life? Does watching your cat sleeping in sunbeams look like heaven to you? If so, writer and artist Pamela Hodges provides a 15-step plan to leave the rat race and become a cat in her book How to Be a Cat for everyone who wishes to be a cat. A book release and signing is scheduled for February 17, 2017, at Studio B Fine Art Gallery, 39A East Philadelphia Avenue, Boyertown, PA, during the opening reception of its upcoming exhibit entitled “Muse,” the studio’s annual exhibit combining visual and literary art. 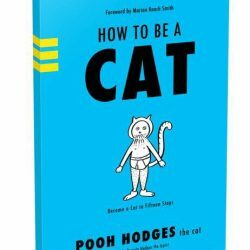 How to Be a Cat includes a certificate of completion, cat diary pages, and several paper cut-out costume pages and provides a perfect gift suggestion for Type A friends and family members in search of greater balance in their lives. Hodges loves cats. Her artwork, showcased at Studio B in the gallery’s recent exhibits, and her self-published coloring book Color the Cats that features forty real cats from around the world and their stories are testimonies to her love of the feline persuasion. A portion of the sales of Color the Cats is donated to Best Friends Animal Society. In addition to the book release, illustrations from the book will be on exhibit and for sale in Studio B’s classroom gallery through March 12, 2017. Currently Hodges types for her cat Harper’s blog: thecatwhowrites.com and maintains her own blog: ipaintiwrite.com. Both enjoy getting mail. Both Pamela and Harper can be found by email ([email protected] and [email protected]), on Facebook ([email protected] and [email protected]), instagram (@pamelahodges and @thecatwhowrites), and twitter (@hodgeswriter and @thecatwhowrites), and they love to get mail. How to Be a Cat is available on Amazon.